The Star Wars movies are a lot of things, but they are not, by and large, funny. Han Solo is of course rich with great one-liners, but many of the trilogy’s attempts at physical comedy or witty asides come across as corny, ham-fisted, or childish. This is part of the appeal, adding a sense of wholesomeness to the whole affair. Still, Darth Vader’s pun in Rogue One struck many as off-base. 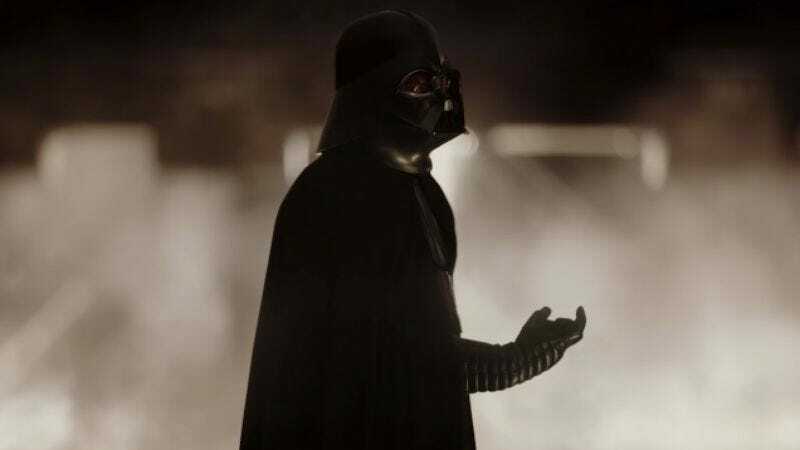 While doing his classic “choke you with his mind” hand move, he told Orson Krennic, “Be careful not to choke on your aspirations.” Would Darth Vader, that chilly icon of evil built around a shattered heart, still find room in his brain for low-rent wordplay? Apparently. Nerdist has extrapolated that moment throughout the ensuing trilogy, creating an image of Darth Vader as a cornball on a camping trip, tossing off knee-slappers that no one, not even he, finds funny. To be honest, this makes him seem even more evil, occupying a world unto himself wherein he amuses no one but subjects everyone to endless irritating puns based on names (Robey-Wan, “is it Hoth in here”) or, well, whatever he’s looking at. There are a lot of-light sabre yucks. They just keep coming, whether you want them to or not, and eventually the sheer weight of their shittiness may break through, loop around, and sort of become funny again. We regret to admit that we chortled aloud at, “What’s the matter? You Luke upset.” Perhaps dad jokes do have a place in this universe after all.